A dazzling new mobile slot by NextGen, but does the game deliver in the extra spins department? We hope you're ready for yet another brightly coloured, intergalactic-themed slot, cause there can never be enough of those in the mobile gambling world, or can there? Uhm, we're convinced there can. Actually, bright, star-lit slots have reached supersaturation as NetEnt has milked the theme to an extreme (think Starburst, Neon Staxx and even Sparks). 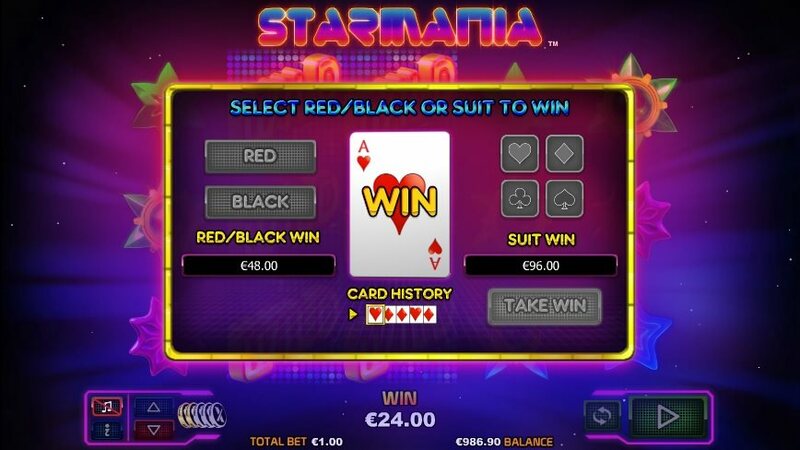 But Starmania does have a few things going for it, which are the extra spins, the Gamble Feature and the extraordinarily high return-to-player percentage. Perhaps a year or at least half a year behind the trend of ‘stellar' slots, we present to you NextGen Gaming's Starmania. It's no Medusa II and it's not the highly acclaimed Foxin' Wins, arguably two of NextGen Gaming's most popular slots, but it still is a pretty good new release. If moderately trippy is precisely your type of slot, then you are going to have fun with Starmania, despite it's lack of truly unique features. Unfortunately, this slot wasn't released on a Thursday to take part in the (useless) Throwback Thursday trend (it actually was released on the 9th of September… a Wednesday…), but it certainly could have, because it has this overwhelming arcade-retro feel. But arcade-retro is good, right? Depends. There is good retro and bad retro, and unfortunately Starmania errs slightly on the bad retro side. The outer space backdrop is alright, but we have an issue with the symbols – the stars of all shapes and sizes. They are p-i-x-e-l-a-t-e-d. Just as it's overwhelmingly annoying to read a word written like that, it gives you a clear idea as to how it feels when our eye constantly catches on the less-than-sharp pixels of the symbols. I'm not sure about the spin button either, but it is nice when comets shoot across the reels to connect the symbols of a winning combination. Slot theme aside, let's talk about winning combinations. This lowish variance slot takes bets anywhere from 10p to £20 and can bring in hefty wins across the 10 fixed paylines. That's especially true because the slot pays both ways, meaning that combos from left to right and right to left count. However, during our entire try-out of the slot, albeit in demo mode, we got small wins here and there, with absolutely no reasons to jump for joy. Actually, as we were keeping an eye on my demo balance, we were happy we haven't yet committed to a real-money game and ended up losing £100 in just 20 minutes. Whoops. And we triggered two Extra Spins rounds during that time, so you'd think that the final balance would fare much better. Nonetheless, the advertised payout percentage is a staggeringly good 97.87%. We're not being conspiracy theorists, but based on the gameplay of Starmania that we've experienced, who say's that's the RTP it actually what it is advertised to be? Above, we've given NextGen Gaming some grief about it's inability to design and absolutely stunning and flawless slot, like Elk Studios' Taco Brothers. Now it's time to take a critical look at it's features. Gimme some extra spins for God's sake! What does it take for a just and fair mobile slots review team to get some extra spins around here, Starmania? It takes us what seems like a million years, no, lightyears, to trigger a extra spins round. Call us impatient, but after five minutes of hopeful anticipation and getting just two measly Bonus symbols on the reels which do nothing for us, we get a suspicious feeling that it might never actually happen. After a while, it happens. We've done it. All for you, our dear readers: to show you that when you are awarded 10 extra spins on Starmania, good things can and will ensue. The round is quite engaging, there are Big Wins when we get a particularly super combination of symbols. On the right of the screen, the Wild-o-Metre goes up with every spin, with more and more Wild Symbols that can appear on the reels with each extra spin. This means that potentially, you can get three rows of Stacked Wilds on reels 2,3 and 4, which could bring massive wins. Meanwhile, we manage to ‘walk away' from this extra spins round, which runs automatically after you trigger the first extra spin, with almost £60 in demo mode. This, in turn, meant nothing in the longer run, however, as the total balance was negative anyway. Oh well. 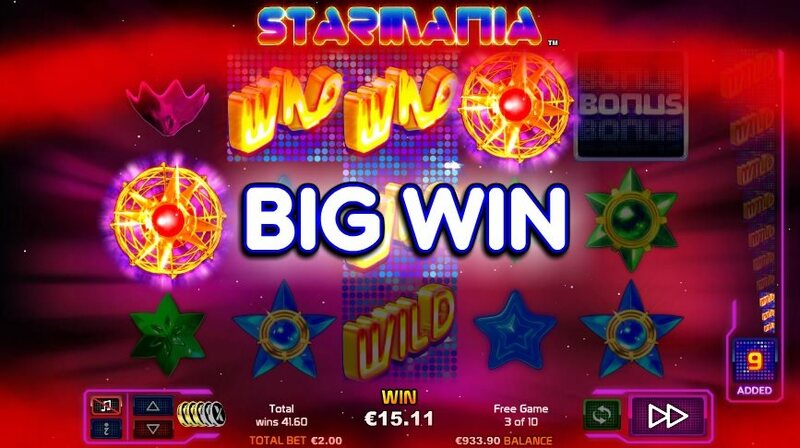 If you want to play Starmania, then look out for NextGen mobile casinos. We couldn't recommend Mr Green casino strongly enough – 200 extra spins are yours! We wouldn't call Starmania "stellar performance" by NextGen Gaming, if you pardon the pun. Whilst the features are alright and the slot is certainly playable and there is nothing majorly wrong with it, it's just too..."been there, done that." Do you really want to travel to the galaxy where everything sort of resembles Starburst, but isn't quite there yet? We mean the soundtrack and the visual effects are definitely better as NetEnt have designed them. However, in terms of winning potential, Starmania does have a slight edge as the RTP of 97.87% is one of the highest ever that we've seen. So although it leaves one wanting more in authenticity, players can really profit from this slot if they've got a solid betting strategy. We can't say it's definitely a 4-star game, because for that you'd need truly spectacular graphics and all sorts of other tricks up a sleeve, but we think it's fair to award three and a generous half stars to Starmania. We just wish that NextGen step up their game a bit with their next release.